I learned something interesting the other day. I had never heard the term “core shift” before. Scott Sehr explained it so that even I could understand. 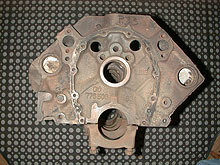 When a block is being cast, the core mold can sometimes shift a little from dead center within the outer mold. 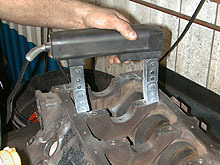 This causes the cylinder walls to be thinner or thicker in spots and the water jackets to be slightly off. A motor with high core shift can run hotter and may be weaker. 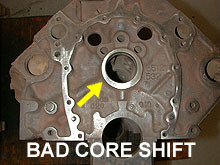 Here's an example of bad core shift. Notice the hole for the cam is off-center in the casting. 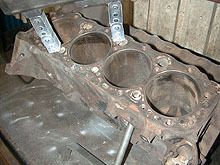 We purposely picked a 4-bolt 350 block with minimum core shift to ensure that things are right from the start. As you can see by looking at the photos, a block with minimum core shift will have an almost centered cam hole. This one is about as close as they come. The entire block was first baked at 600 degrees for several hours, then washed. The next step is to magnaflux it to check for any cracks. Magnafluxing is where a fine mist of metal is sprayed on the block while it is magnetically charged by an electromagnet. Any cracks will show up easily. Here he is checking the crank journal area and webbing for cracks. A common area for small blocks to crack is by the boltholes and oil passages. 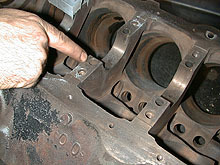 Inspect these (as well as the rest of the block) with care. This is definitely not the place you want to have a problem with on a high horsepower engine. Along the valley is another place to check for cracks. Sehr says that when you work on as many motors as they do, you'll find that cracked blocks are more common than you'd expect. 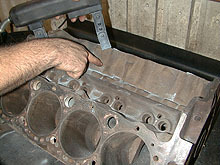 This photo shows the cylinders being checked. Magnafluxing is completed and the block gets an “A”. We are guessing this is an early 70's block. It's never been bored and is in very good condition. It should make a stable foundation for our “Project Power Plant”. The block is being blasted at this writing and work will begin soon on the build-up! Keep watching.